Sorry it took me so long, but I have the second of my butterfly posts finally ready. For this butterfly you can actually make it a small science type unit. I usually start of f the "unit" by reading the story, "The Very Hungry Caterpillar," by Eric Carle. This is a great story--very basic, but it explains that a caterpillar is hatched from an egg, eats and eats, spins a cocoon, then comes out as a butterfly. As a side note, Eric Carle is a wonderful author for children. I enjoy his books immensely and we use a lot of them for many different units at school. Here are the items you will need for the whole thing: clip clothespin, pom poms, tacky glue, wiggle eyes(optional), toilet paper tube, tissue paper, coffee filter, markers, and water sprayer(optional). If you only want to make the butterfly, you do not need the toilet paper tube or tissue paper. After reading the book, have the children make a caterpillar. 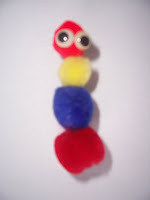 To make the caterpillar you will need: a clip clothespin, pom poms, and glue. I also used wiggle eyes--if you haven't noticed yet, I love wiggle eyes. The children glue the pom poms to the clothespin--you usually have to use a pretty good glue. I like a material called tacky to help hold objects like pom poms. After the pom poms are glued the children can add eyes. The head of the caterpillar is the part of the clothespin that you would squeeze. Now for the next part of the unit you would need a toilet paper tube and tissue paper. 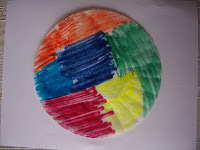 The children put the caterpillar into its cocoon(the toilet paper tube) then glue on tissue paper to seal the tube. Sometime during the two weeks as the butterfly is going through its metamorphosis in the cocoon, have the children take a coffee filter and some markers. Let them color the filter so it is very colorful. 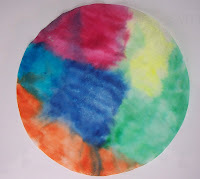 I like to spray the coffee filter with some water afterwards so th e colors mix. Let dry. Now comes the sneaky part; when the children are unaware, open one end of the tube, take out the caterpillar, then scrunch together the filter in the middle. 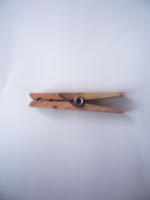 Open the clothespin and attach the wings. Then carefully wrap the wings around the caterpillar and reinsert it into the cocoon. Hopefully the children will see the cocoon has "opened" and will pull out a wonderful surprise. If they don't notice, you might have to direct their attention to the cocoon. For my three year old class we only read the book then make the butterfly. We are only at school two days a week and it is hard to have a unit run for more than a week. So we usually just make these pretty butterflies near the end of the year. If you would like, you can even put a magnet on the back. 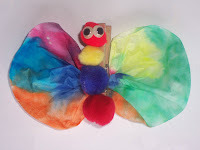 I hope you enjoy creating this butterfly with your preschooler. When I see your nice illustration, I repent for my school days. Wish your blog would have been there. Anyway, I'll advise others to watch your blog. It really kindles creativity. This is such a great butterfly. And my kid loves this book. Looking for coffee filters as we speak. What a wonderful project for the kiddies. You are so creative. Good job!